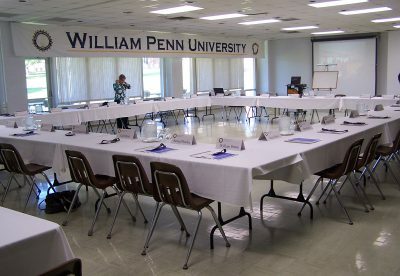 Whether your group anticipates a training seminar, a private awards ceremony, or an elegant reception with friends and family, William Penn University’s goal is to provide your group with quality service. We offer unique and traditional facilities, audio/visual equipment, catering, and more. We have facilities for indoor or outdoor activities, including athletic events. The success of your event is our highest priority. By utilizing our resources to best meet your needs, we provide a welcoming environment for all groups. For more information regarding rental fees, the planning process, or booking your event please contact Miranda Keeler, Marketing & Communications Manager, at 641-673-1078 or by email. Download our Facilities Policies & Procedures for more information. Sodexo Catering Service is available to cater all conferencing events. Sodexo provides an extensive menu that caters to best fit your needs. 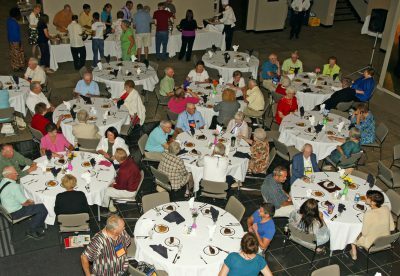 They offer refreshments, informal and formal buffets, and several take-out options. Their commitment is to customize menus for your occasion. From a formal dinner to meeting break refreshments, they offer creative menus, attractive presentations, and thoughtful service to provide your guests with a memorable dining experience. Please contact Sodexo directly if you are interested in having your event catered. View menu options.